Polycrystalline ceramic materials offer advantages including robustness over conventional glass as gain media for solid state lasers: devices that find many applications such as laser processing and medical surgery. Recently, there has been renewed interest in fluoride ceramics lasers for ultrashort pulse laser oscillators/amplifiers. Here, Shotaro Kitajima at the University of Electro-Communications, Tokyo, Hitoshi Ishizawa at Nikon Corporation, and colleagues report on the development of the first Yb3+-doped CaF2-LaF3 ceramic laser with a maximum power output of 4.36 W and slope efficiency of 69.5%. 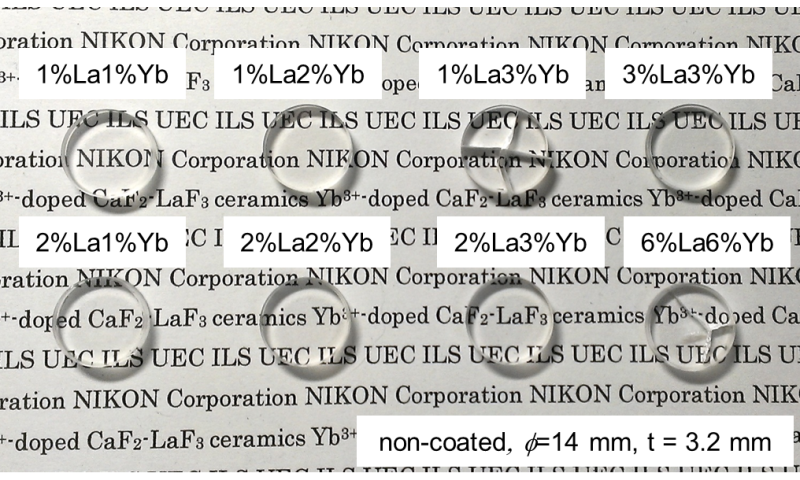 Kitajima and colleagues fabricated CaF2 ceramics doped with two rare earth ions of La and Yb from 1 at. % La3+, 1 at. % Yb3+ to 6 at. % La3+, 6 at. % Yb3+. The doping was carried out using a wet process to mix CaF2 with two kinds rare-earth fluorides with average diameters of 200 nm. This was followed by sintering first between 750°-900° in air followed by the hot isostatic pressing method between 700°-1000° in an inert atmosphere. Notably, the random orientation of the axes of grains in ceramics improves their mechanical robustness, which is one of the main motivations for producing CaF2 ceramics for gain media. The findings described in this paper show that it may be possible to significantly improve the physical properties of Yb: CaF2-ceramic materials for high performance laser gain media.